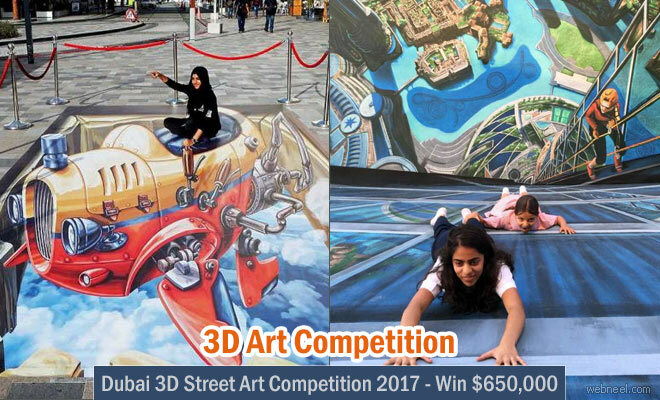 Dubai welcomes 3D Artists which is all set to happen in March 2017. December 15th 2016 is the last date for submission. The award, which carries a total prize money of $650,000 was launched at the second Dubai Canvas Festival last March. The final prize-winner will be awarded $300,000 prize money. This is the first time an award of excellence is given for 3D art category. The theme for the 3D Art award is 'Happiness', so artists from all over the world are invited to take part and win laurels. A jury comprised of renowned international and local artists will evaluate the submissions to name three winners. There will also be awards in two special categories – ‘Best Emirates Participation’ and ‘People’s Choice’. The latter award will be based on public votes. Brand Dubai will fly 10 nominees to Dubai and cover accommodation costs. The 10 nominees will be selected based on the artwork they submitted via the Brand Dubai website and email. The artists will execute their artwork during the Dubai Canvas Festival in March 2017, a total of 5 winners will be announced at the end of the festival. To enter the Award, artists should submit original works of art never displayed before. We are seeking distinctive works of art that display a high standard of skill and creativity. Detailed criteria and guidelines for the Award, developed by the jury, will be announced soon. Technical specifications for the entries will also be published soon on Brand Dubai’s website. Each artist can submit up to two works for the competition. However, only one work from an artist can win a prize. The winners will be honoured at the next Dubai Canvas Festival to be held in 2017. Theme for the Competition : The choice of ‘Happiness’ as the Award theme is inspired by the UAE’s own focus on people’s happiness as one of its most important goals. The theme also reflects Dubai’s objectives of becoming a city of happy, creative and empowered people and a preferred place for people from across the world to live, work and visit. - Promoting creative excellence in 3D art across the world. - Providing support for 3D art and artists to flourish. - Providing opportunities for emerging 3D artists. - Enhancing standards of 3D art in the region.